46" x 65" x 3"
In Geometry of Me, I address the shapes of my Catholic high school summer uniforms. Immobile heads and arms extend rigidly from homogenized triangular forms, while the introduction of hinged leg joints suggests the potential for motion. 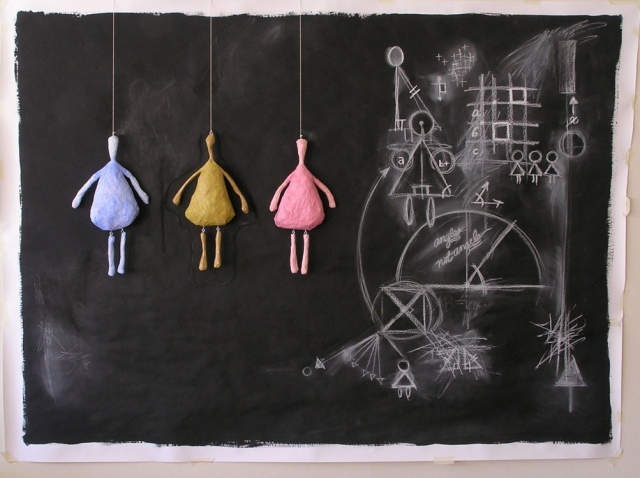 Suspended against a backdrop of pseudo-geometry formulas and diagrams, the figures contrast with the blackboard writing. The phrase, “angles not angels,” is a quote from a math teacher who wanted to ensure the correct spelling of linear intersections; however, its use here speaks to the irony of how teenage girls (angels) struggle to occupy space. The equations, grids and diagrams reference formulas for the female body.